The Golden Ring is a loop of very old towns northeast of Moscow that preceded the present capital as the cultural heart of Russia. 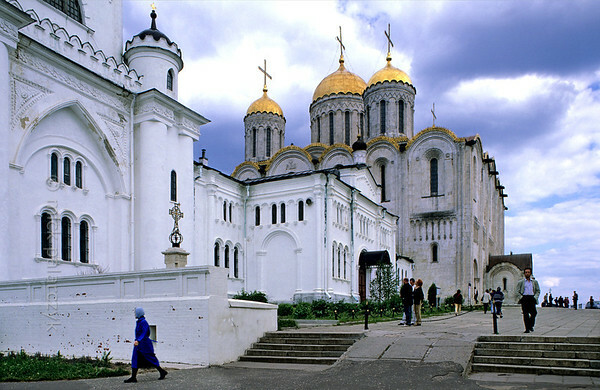 Monasteries, kremlins and churches offer a spectacular array of early Russian art, architecture and history. No less enchanting is the countryside with its peaceful villages and beautifully decorated wooden houses. 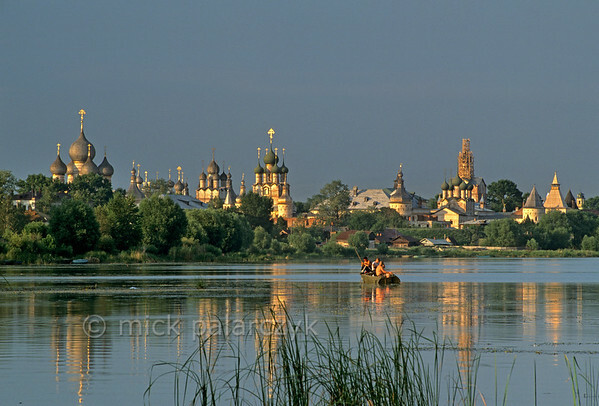 [RUSSIA.GOLDENRING 26.145] ‘Rostov’s kremlin.’ The fairy tale of Rostov-Veliky’s kremlin is best appreciated from a boat on Lake Nero. The two highest structures are the Gate-Church of St. John (with green domes) and the Assumption (Uspensky) Cathedral (with gray domes). Although founded in the 12th century nearly all the buildings in the kremlin date from the 16th and 17th centuries. Photo Mick Palarczyk. 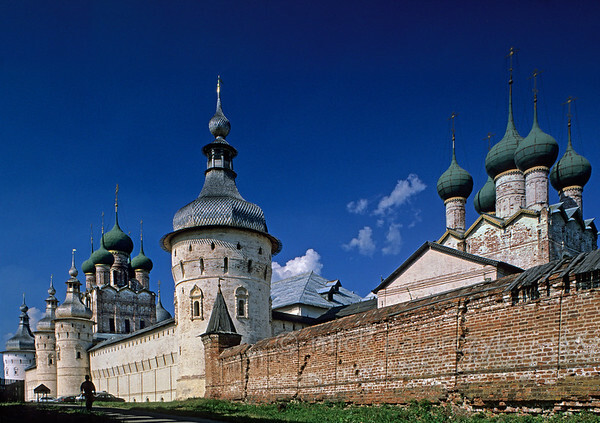 [RUSSIA.GOLDENRING 26.140] ‘West wall of Rostov’s kremlin.’ The western wall of Rostov-Veliky’s kremlin displays an impressive ensemble of churches and towers. From right to left: the St. Gregory Church, a wall-tower, the Gate-Church of St. John with two gate-towers just in front of it and finally another wall-tower. Photo Mick Palarczyk. [RUSSIA.GOLDENRING 26.129] ‘Fishing near the kremlin.’ Boys fishing on Lake Nero have a superb view of the many domes in the kremlin of Rostov-Veliky. Photo Mick Palarczyk. [RUSSIA.GOLDENRING 26.137] ‘Six-winged angel.’ Six-winged angels, battered by time and leakage, guard the interior of the 17th century Gate-Church of the Resurrection in the kremlin of Rostov-Veliky. Photo Mick Palarczyk. 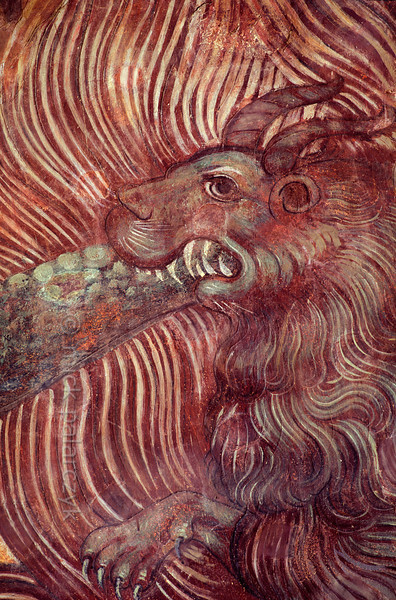 [RUSSIA.GOLDENRING 26.135] ‘Hellish monster.’ A hellish monster forms part of a 17th century Last Judgment scene painted on the walls of the Church of the Saviour-over-the-Galleries (Tserkov Spasa-na-senyakh) in the kremlin of Rostov-Veliky. Photo Mick Palarczyk. 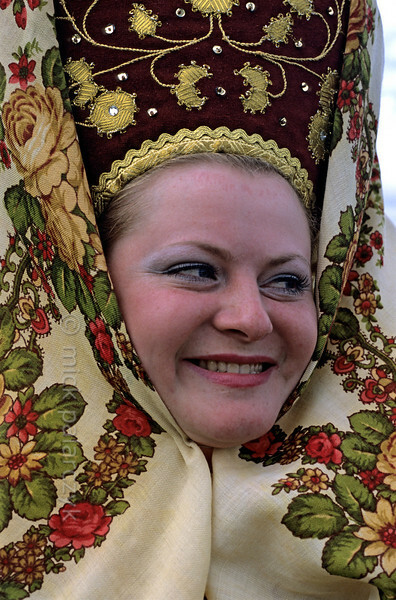 [RUSSIA.GOLDENRING 25.981] ‘Girl with kokoshnik.’ At Suzdal a girl is wearing a kokoshnik (traditional high cap) covered by a namitka (headkerchief) during Troitsa (Whit Sunday) festivities. Photo Mick Palarczyk. 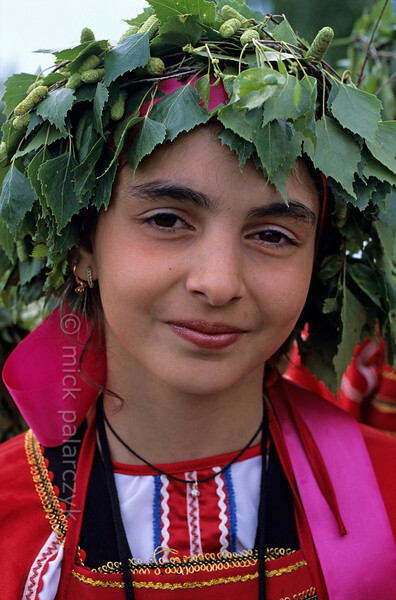 [RUSSIA.GOLDENRING 25.989] ‘Girl with wreath.’ During Troitsa (Whit Sunday) festivities in Suzdal a girl in traditional dress wears a wreath of birch twigs. The birch personifies the renewal of life in spring. Photo Mick Palarczyk. 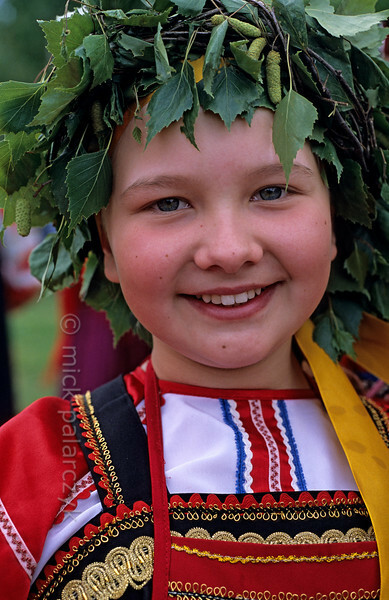 [RUSSIA.GOLDENRING 25.987] ‘Girl with wreath.’ During Troitsa (Whit Sunday) festivities in Suzdal a girl in traditional dress wears a wreath of birch twigs. The birch personifies the renewal of life in spring. Photo Mick Palarczyk. 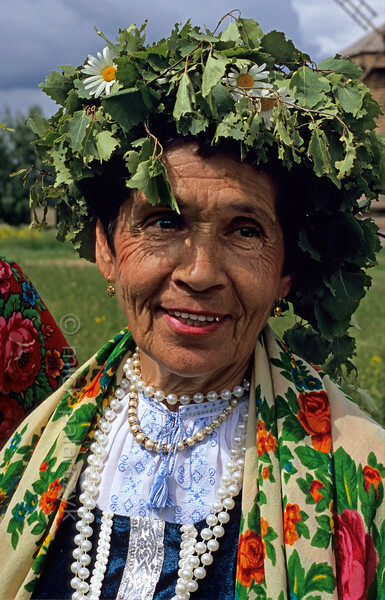 [RUSSIA.GOLDENRING 25.973] ‘Troitsa festivities.’ During Troitsa (Whit Sunday) festivities in Suzdal a woman wears a wreath of birch twigs intertwined with marguerites. The birch personifies the renewal of life in spring. Photo Mick Palarczyk. 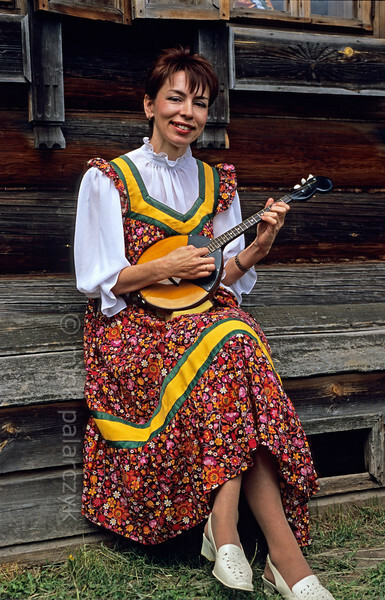 [RUSSIA.GOLDENRING 25.977] ‘Playing a domra.’ At Suzdal a girl is playing a three-stringed domra during Troitsa (Whit Sunday) festivities. Photo Mick Palarczyk. 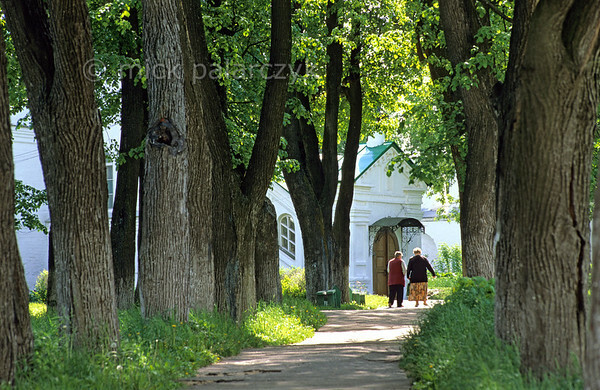 [RUSSIA.GOLDENRING 25.905] ‘Alexandrov’s convent.’ In the town of Alexandrov, a lane on the grounds of the 17th century Dormition (Uspenski) convent provides a pleasant surrounding for the town’s pensioners. Photo Mick Palarczyk. 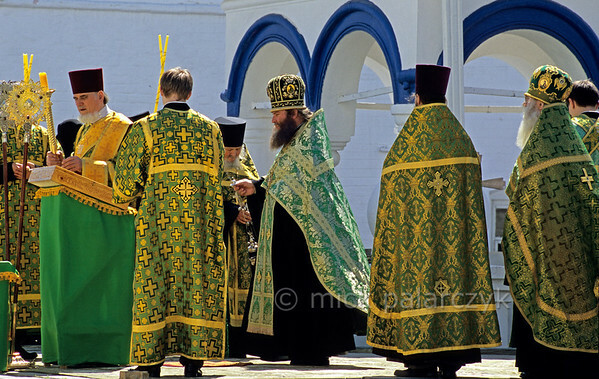 [RUSSIA.GOLDENRING 25.915] ‘Outdoor mass.’ Displaying a feast of colourful brocade garments, Russian Orthodox priests celebrate an outdoor Whit Saturday mass in the monastery at Bogolyubovo. Photo Mick Palarczyk. 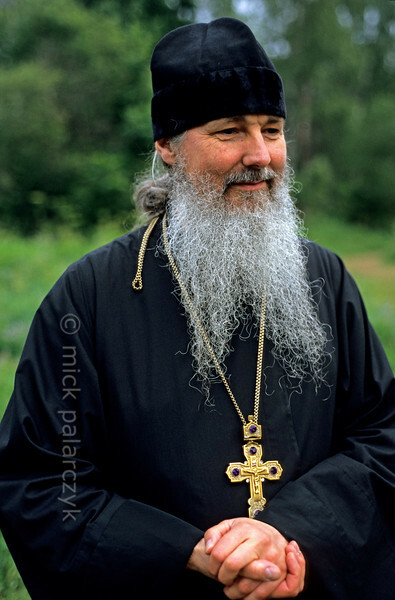 [RUSSIA.GOLDENRING 25.917] ‘Russian Orthodox monk.’ Russian Orthodox monks are generally bearded and black-robed. Photo Mick Palarczyk. 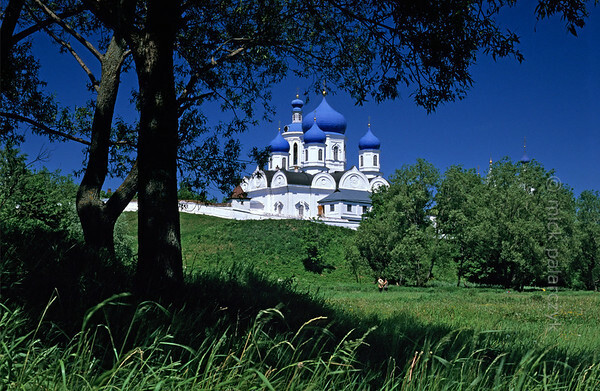 [RUSSIA.GOLDENRING 25.922] ‘Cathedral at Bogolyubovo.’ Perched on the high bank of the Klyazma River, the Assumption (Uspenski) Cathedral (1866) of the Bogolyubovo Monastery displays its white walls and blue onion domes. Photo Mick Palarczyk. 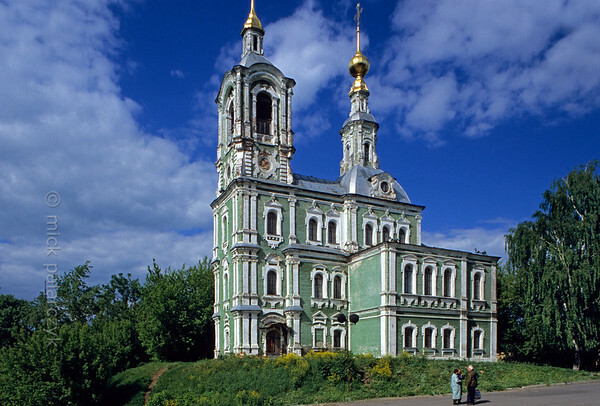 [RUSSIA.GOLDENRING 25.926] ‘Russian Baroque.’ A rich Vladimir merchant built this peculiar Church of St. Nicetas (1765) in a baroque style with a multitude of pilasters and windows. Inside the building is divided into three separate churches each occupying one floor. Photo Mick Palarczyk. [RUSSIA.GOLDENRING 26.149] ‘Rostov’s kremlin.’ The fairy tale of Rostov-Veliky’s kremlin is best appreciated from a boat on Lake Nero. The two highest structures are the Gate-Church of St. John (with green domes) and the Assumption (Uspensky) Cathedral (with gray domes). Although founded in the 12th century nearly all the buildings in the kremlin date from the 16th and 17th centuries. Photo Mick Palarczyk. 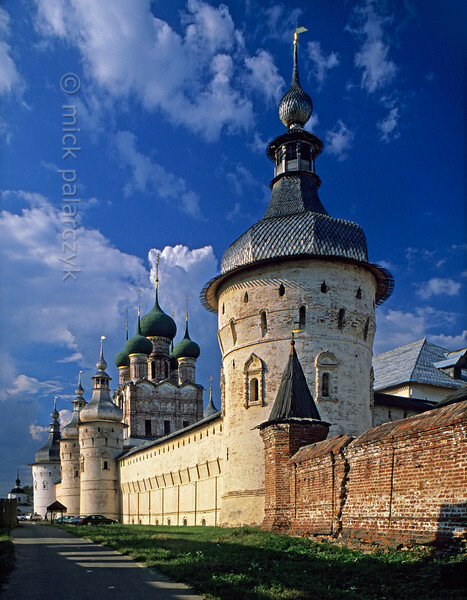 [RUSSIA.GOLDENRING 26.141] ‘West wall of Rostov’s kremlin.’ The western wall of Rostov-Veliky’s kremlin displays an impressive ensemble of domes and towers. From right to left: a wall-tower, the Gate-Church of St. John with two gate-towers just in front of it and finally another wall-tower. Photo Mick Palarczyk. 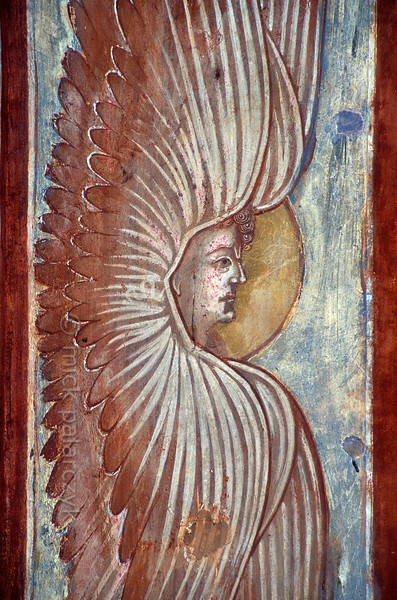 [RUSSIA.GOLDENRING 26.138] ‘Six-winged angel.’ Six-winged angels guard the interior of the 17th century Gate-Church of the Resurrection in the kremlin of Rostov-Veliky. Photo Mick Palarczyk. 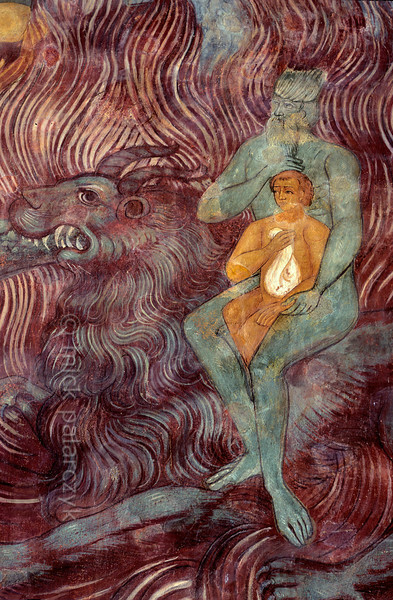 [RUSSIA.GOLDENRING 26.133] ‘Judas and his pieces of silver.’ Judas keeps his bag with thirty pieces of silver pressed to his breast while sitting in the lap of a satan who is riding a hellish monster. 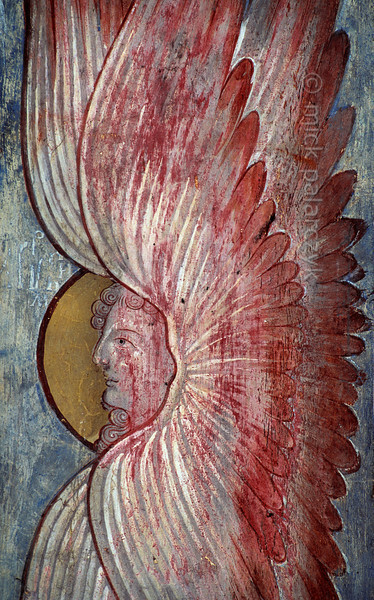 Detail of a 17th century fresco in the Church of the Saviour-over-the-Galleries (Tserkov Spasa-na-senyakh) in the kremlin of Rostov-Veliky. Photo Mick Palarczyk. 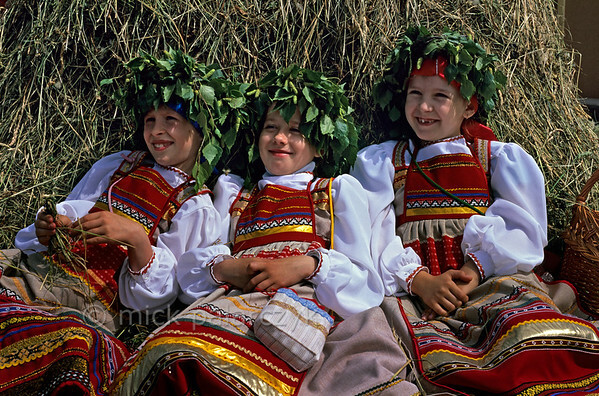 [RUSSIA.GOLDENRING 25.984] ‘Resting in the hay.’ During Troitsa (Whit Sunday) festivities in Suzdal girls in traditional dress wear wreaths of birch twigs. The birch personifies the renewal of life in spring. Photo Mick Palarczyk. 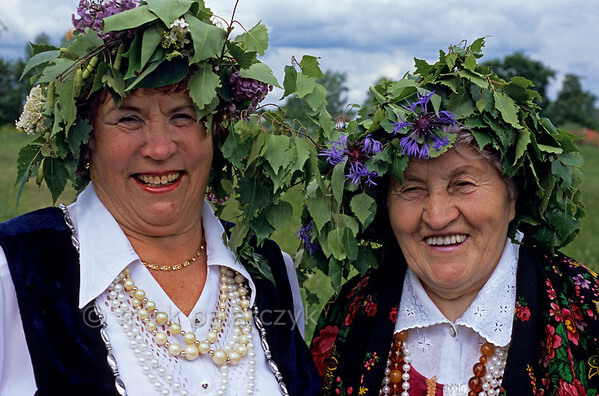 [RUSSIA.GOLDENRING 25.965] ‘Troitsa festivities.’ During Troitsa (Whit Sunday) festivities in Suzdal elder ladies wear wreaths of birch twigs intertwined with lilacs and cornflowers. The birch personifies the renewal of life in spring. Photo Mick Palarczyk. 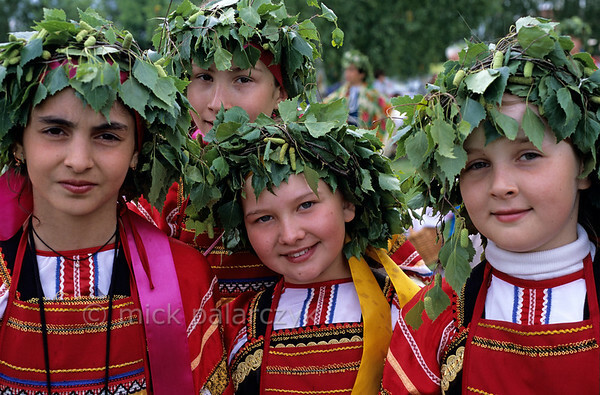 [RUSSIA.GOLDENRING 25.986] ‘Birch girls.’ During Troitsa (Whit Sunday) festivities in Suzdal girls in traditional dress wear wreaths of birch twigs. The birch personifies the renewal of life in spring. Photo Mick Palarczyk. 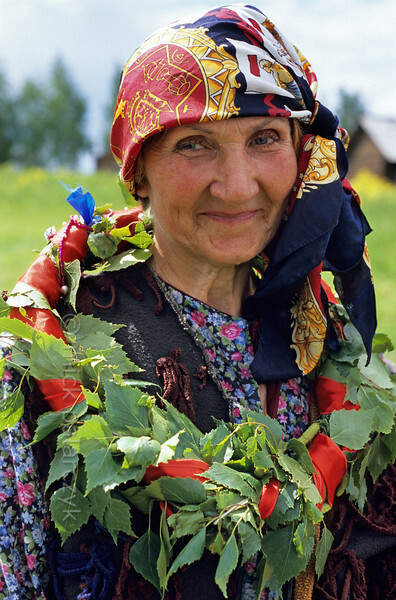 [RUSSIA.GOLDENRING 25.968] ‘Troitsa festivities.’ During Troitsa (Whit Sunday) festivities in Suzdal a woman wears a wreath of birch twigs intertwined with cornflowers. The birch personifies the renewal of life in spring. Photo Mick Palarczyk. 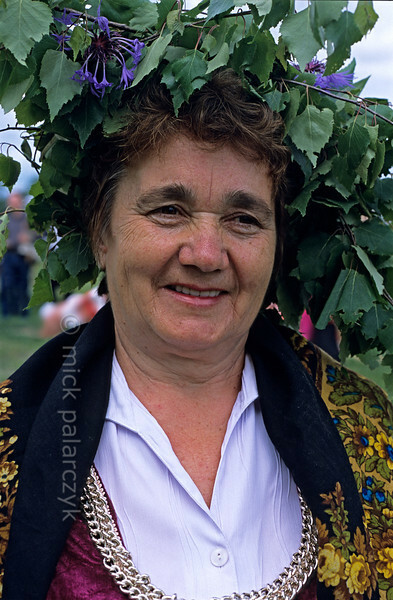 [RUSSIA.GOLDENRING 25.974] ‘Troitsa festivities.’ During Troitsa (Whit Sunday) festivities in Suzdal a woman wears a wreath of birch twigs. The birch personifies the renewal of life in spring. Photo Mick Palarczyk. 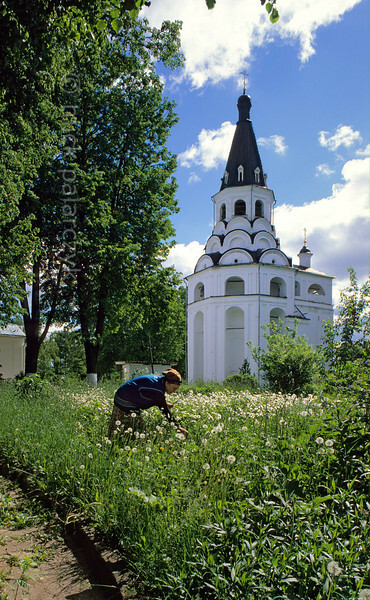 [RUSSIA.GOLDENRING 25.909] ‘Bell-tower in Uspenski convent.’ A prominent structure of Alexandrov’s Dormition (Uspenski) convent is the tall 17th century bell-tower with tented roof. It is built around an older 16th century belfry and has three tiers of kokoshniks (horseshoe arches). Photo Mick Palarczyk. 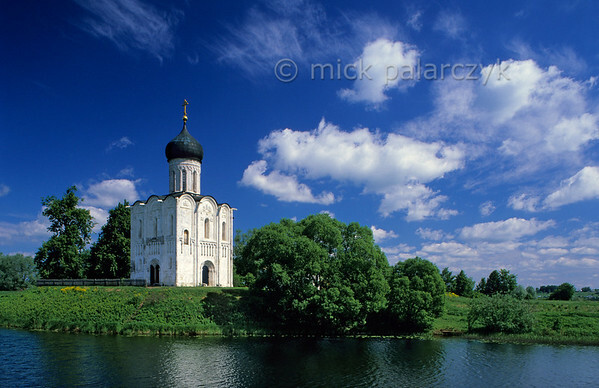 [RUSSIA.GOLDENRING 25.913] ‘Solitary church at Bogolyubovo.’ The Church of the Intercession on the Nerl (Pokrova Bogomateri Church) was built in 1165 on an artificial mound at the confluence of the Nerl and Klyazma Rivers near Bogolyubovo. 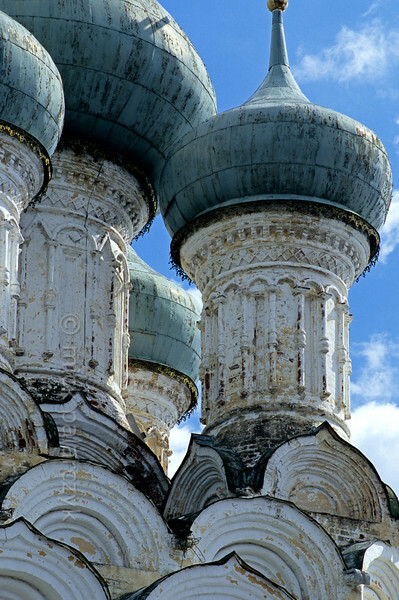 Its solitary setting and elegant architecture make it one of Russia’s most beautiful churches. Photo Mick Palarczyk. 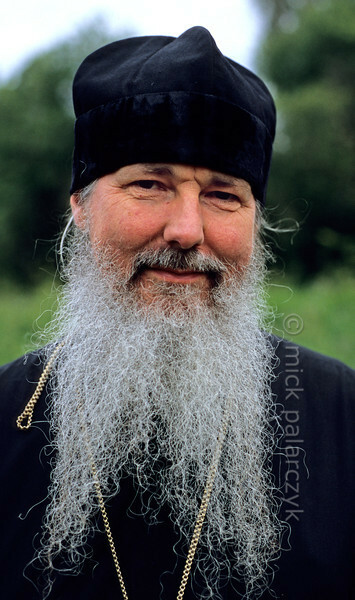 [RUSSIA.GOLDENRING 25.916] ‘Russian Orthodox monk.’ Russian Orthodox monks are generally bearded and black-robed. Photo Mick Palarczyk. 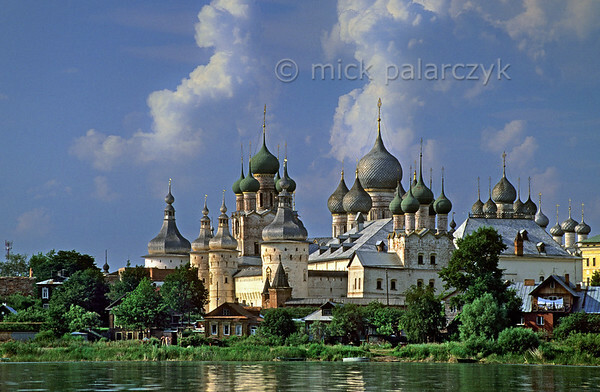 [RUSSIA.GOLDENRING 25.919] ‘Bogolyubovo Monastery.’ Seen from the meadows along the Klyazma River, the Assumption (Uspenski) Cathedral (1866) and bell tower (1841) of the monastery at Bogolyubovo shimmer as a blue and white apparition above the horizon. Photo Mick Palarczyk. 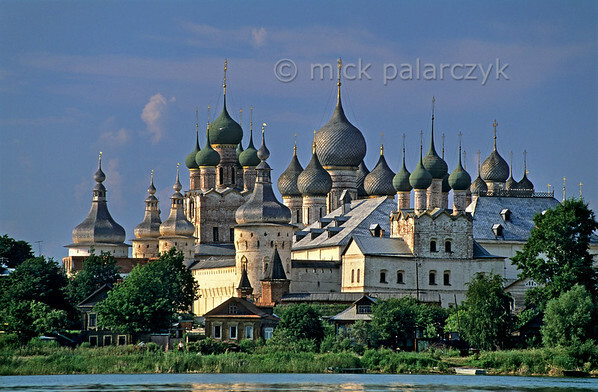 [RUSSIA.GOLDENRING 25.924] ‘Onion domes at Vladimir.’ At Vladimir the onion domes of the Assumption (Uspenski) Church (1649) rise above tiers of so-called kokoshniks (horseshoe shaped arches). Photo Mick Palarczyk. [RUSSIA.GOLDENRING 25.928] ‘Victim of the Mongols.’ Vladimir’s Assumption (Uspenski) Cathedral (12th century) was severely damaged in 1238 by the Mongols who torched the building with the prince’s family and the bishop inside. The cathedral remained standing however and was restored. Photo Mick Palarczyk.